In his brilliant and demanding book, In the Break: The Aesthetics of the Black Radical Tradition, theorist Fred Moten describes Billie Holiday’s Lady in Satin as a “record of a wonderfully articulate body in pain.” (107) Recorded as Holiday’s body was literally falling apart, Lady in Satin lacks the robustness and sassiness that marked so many of Holiday’s earlier recordings. Here, Holiday is defiant, though, embracing death in the full bloom of her imperfection(s). As Moten writes, Holiday, “uses the crack in the voice, extremity of the instrument, willingness to fail reconfigured as a willingness to go past…” The same could be said for Soul singer Linda Jones who recorded her most famous tune, “Hypnotized” a decade after Holiday’s death. What links Holiday and the largely obscure Jones, is the violence they enacted—lyrically and musically—within the realm of their vocal performances. This was a violence, that in large part, was a response to that which their own bodies bore witness to—how does one sing of a body in pain? Born in Newark, NJ in 1944, Jones spent much of her childhood and early adulthood struggling with a debilitating case of diabetes, which as writer Becca Mann suggests, “lent her career an urgency.” The disease led to Jones’ early demise at the age of 28—she was in the midst of successful week-long engagement at the Apollo Theater in Harlem at the time of her death in 1972. Vocally, Jones style can only be described as “fits of melisma”—melisma being that particular style of vocal performance that is marked by the singing of single syllables across several pitches—and it is likely one of the reasons, including lack of national distribution, Jones never found a mainstream audience for her music. Though some found Jones performances as overwrought, that was exactly the point; Jones performed songs like “That’s When I’ll Stop Loving You” or “For Your Precious Love” not simply as performative gestures, but as if she knew she was dying. What distinguished Jones from a figure such as Holiday, was the extent that Jones made palpable the influence of the Black Church on her vocal style. As such, Jones was of a generation of vocalists, who were making the transition from the gospel choirs of their youth onto the secular music charts. Sam Cooke was of course a tremendous influence in this regard and in Jones’s case that influence can be clearly heard on her soul stirring performance of “That’s When I’ll Stop Loving You” on the live recording Never Mind the Quality…Feel the Soul. Cooke’s singing was a model of control and restraint, performed under the guise of aesthetic risk-taking—Cooke arching to reach that high-note, only to float seamlessly across a phrase. Jones, in comparison, had no interest playing to the fiction that she was in control of anything—the music, her voice and at times her own body. Both artists had the ability to present an aura of vulnerability that made their music so palpable to audiences—Cooke’s emotiveness was particularly striking for a male singer—but in Jones case shewas vulnerable and each performance was an attempt grasp a slither of the humanity that was slowly departing from her. Jones, like Cooke and others including Franklin and Sly Stone (Sylvester Stewart) helped secularize African-American gospel ritual in the late 1950s and 1960s. In his work on the tradition of African-American gospel quartets (the specific tradition that helped produce Cooke), Ray Allen writes, “in its ritualized context, gospel performance promises salvation for the believer in this world as well as the next. Chanted narratives remind listeners of their past experiences, collective struggle, common southern and familial roots, and shared sense of ethnic identity.” (The Journal of American Folklore, Summer 1991). Such rituals likely allowed Jones to provide her audience with some language to better interpret the aspects of her performance that were simply beyond language. In this regard, Jones literally had to talk through those aspects of her pain—testifyin’ as it were—in order to better galvanize her audience, which was largely African-American, around her pain and by extension the pain uniquely experienced by African-American women. The irony for Jones is that it was never about simply “shedding one tear”, but a cavalcade of shrieks, screams and cries that found its place in the violence she did literally to each note she sang. As Elaine Scarry observes in her now classic book The Body in Pain (1985), one of the dimensions of physical pain is “its ability to destroy language, the power of verbal objectification, a major source of our self extension, a vehicle through which the pain could be lifted out into the world and eliminated.” (54) . Here Jones suggest that the “Lord” was not fully attentive to her needs. Though this could be read as a rejection of religious practice, I’d like to suggest that, given Jones' use of the African-American gospel ritual, that she was instead rejecting the distinctly masculine concerns (“he don’t hear me”) in which often frame such practices. In other words, Jones is suggesting that if such practices were fully cognizant of the lives of black women, as embodied in Jones’s voice, the emotional and sexual desires of black women would be addressed. In Jones’ case the desire for companionship, in the midnight hour, was infused with the knowledge that any midnight could be her last. 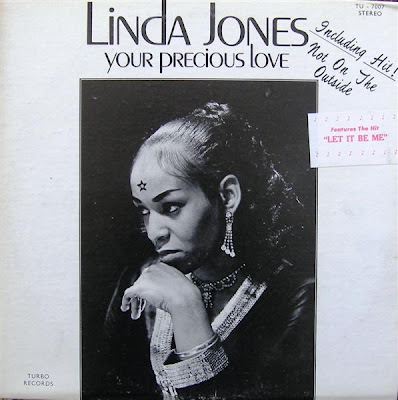 Whereas the Soul singers of Linda Jones’ era often strategically deployed their use of melisma, it can be said that many contemporary R&B singers have a case of the runs. For example what often marked the best performances of seminal R&B singer Luther Vandross, was his ability and willingness to leave his audiences anxious in wait for the deep runs that he was noted for. With a flair for the dramatic, Vandross often held out those runs towards the end of a song as a form artistic denouement—a final pronouncement, if you will, of his singular vocal genius. In the case of Vandross and others of his generation (think here of Whitney Houston at her peak), these moment were to be cherished—a grand gesture for the audiences that supported his music. Such subtleties have largely been lost on the contemporary crop of R&B singers, who often break into frantic riffs and runs midway through the first verse, in the process cheapening the integrity of the lyric as well as audience’s investment in their craft. And it’s not necessarily the fault of the singers, at a moment when so-called “urban” music is being driven by producers whose skill set is largely related to making beats and many young singers are simply not getting the vocal direction that the deserve. For example producers such as Jerry Wexler and Tom Dowd were seasoned veterans when they worked with Aretha Franklin upon her move to Atlantic Records in 1967 after languishing at Columbia Records for a few years. In the case of Patti LaBelle, another vocalist well known for her histrionics, one of her most popular recordings as a solo performer—“If Only You Knew” (1983)—was the product of her collaboration with Kenneth Gamble and Leon Huff. The duo had worked with LaBelle a decade earlier on Laura Nyro’s Gonna Take a Miracle and thus knew how to reign in her voice to produce, what remains, her most nuanced performance. Too often contemporary R&B singers are working with producers who have been in the game only a few years longer than they have. This lack of experience by producers and vocalists often adds to the dissonance that resonates in the vocal quality of figures like Mary J. Blige or Faith Evans, who have become easy targets for a generation that is regularly thought to be out of tune—musically, morally, and politically—with the Soul singers of the 1960s and 1970s. But I’d like to suggest that such dissonance is not simply the product of a generation of singers who are out of pitch—and lacking the training to know so—but a response to the ways that post-Civil Rights generations hear the world. The nostalgic harmonies of the Civil Rights Generation (and their parents, many of whom are in the 80s) strikes discord in the lives of post-Civil Rights generations, notably Generation Hip-Hop, which have never had a tangible relationship to concepts such as “freedom” and “liberation” that some in the old guard presumed was transferable. Issues like the crack cocaine epidemic, the prison industrial complex, police brutality, voter disenfranchisement largely based on race and class, wage depression, lack of access to quality and affordable healthcare, misogyny, the failing infrastructure of public schooling, homophobia, as well as a populism of common sense (which by definition is stridently conservative and anti-intellectual), have often left post-Civil Rights generations grasping for straws, much the way Keyshia Cole—who I offer for your consideration—seems to frantically grasp for notes in virtually every song that she sings. In the case of Cole, her singing style really is the embodiment of her on-going desire to hold together a life that has been fragmented by an absentee-father, a drug addicted and incarcerated mother, a difficult stint in foster care and her years as a runaway. Cole’s debut recording The Way It Is (2005) provides some context for her near-tragic back-story, which became the basis of a reality show (production on season two is about to begin) which captures Cole’s attempts to find some closure to her relationship with her mother and the hard-scrabble Oakland community that reared her. And though none of Cole’s songs, many of which she co-wrote, speak directly to the struggles of her childhood and teenage years, those difficulties are implicit in lyrics like “I used to think that I wasn’t fine enough/And I used to think that I wasn’t wild enough” (from “Love”) which powerfully attest to Cole’s desire to be loved—by any somebody—and the desire to matter in society that has shown little love for young, poor, and homeless black girls. It was in fact a demo copy of Cole’s “Love” that found its way to industry executive Ron Fair in 2003 and became the stimulus for his signing of Cole to Interscope A&M Records. As Fair recently noted, “When [Cole] sings, there’s real feeling in the notes…There’s pain in her voice that is coming from reality.” (LATimes, 4.20.06) Much of the drama in “Love” pivots on Cole’s utterances of the words “found/find” throughout the song’s chorus (“Love, never knew what I was missing, but I knew once we start kissing I fououououounnd, love”). In the context of the song, found is the virtual space where Cole finds some emotional and psychic grounding. But as the tortured nature of the performance suggest, this space offers little solace—if Cole relaxes one bit, the performance literally falls flat—as Cole is symbolically in constant turmoil with the melodic terrain that she is largely responsible for creating. With a successful reality series in rotation and relative mainstream visibility for her music, Keyshia Cole has access to an audience that Linda Jones couldn’t even imagine. What the two artists share is a willingness to make plain, musically, the pain that has defined their lives, in the process creating a sensual and spiritual space which gives voice to the wide ranging desires and fears of black women—even as so many simply want render their music as little more than noise. A version of this essay was published in the collection The Best African-American Essays, 2009.